Saudi foreign policy-makers and their advisors and partners in and beyond the Middle East are busy crafting a new strategy as part of Riyadh’s plans to boost its international profile. 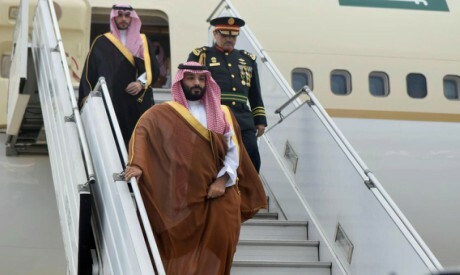 Regional sources say the trip by Saudi Crown Prince Mohamed bin Salman which began this week to the United Arab Emirates (UAE), then on to Bahrain and Egypt, later taking in Tunisia and Algeria ahead of reaching Argentina to take part in the G20 summit, has been designed so Bin Salman can brief Riyadh’s closest allies of Saudi Arabia’s plans, and reassure them of the kingdom’s continuing commitment to regional stability. In the words of one Washington-based American source, Riyadh’s strategy is “by and large what MbS has been promising since he took a central role in his country”. It includes giving a serious push to Palestinian-Israeli peace negotiations and stabilising Arab countries that have gone through a tough transition following the ouster of dictators. An international diplomatic source says the UN envoy for Yemen received assurances from Riyadh during his recent visit that Saudi Arabia was working to support peace talks between Yemeni parties planned for the first week of December. A Cairo-based European diplomat who follows Gulf relations closely said that the beginning of the end to the war in Yemen was approaching, and will have been discussed by Bin Salman and Mohamed Bin Zayed, the de facto ruler of the UAE. Saudi Arabia and the UAE have promised a major aid package to alleviate the humanitarian crisis in Yemen where close to one million people face famine and disease. Another international diplomatic source said the humanitarian package is likely to be executed promptly, with US support, to help boost Riyadh’s severely shaken international reputation. In recent weeks Riyadh has had to devote most of its political capital, and much of its economic clout, to negotiating the ramifications of the murder of Saudi journalist Jamal Khashoggi in the Saudi Consulate in Istanbul. Trump has repeatedly insisted that Saudi Arabia is an indispensable US ally and the Khashoggi story, says a Cairo-based Western diplomat, is likely to “be put aside by the administration”. Diplomatic and political sources say a major goal of Saudi foreign policy in the coming weeks is to clear a path towards the beginning of peace talks. A Palestinian Authority source speaking from Ramallah ahead of Bin Salman’s tour said the crown prince’s father, King Salman, had been involved in persuading Abbas to attend talks, and Bin Salman’s visit to the UAE and to Egypt was intended to signal the three countries’ prioritising of Palestinian-Israeli peace talks. While nobody will offer a clear date as to when Trump will go public with his proposed Palestinian-Israeli peace deal most sources suggest an announcement is likely some time in January. According to one well-informed Arab diplomat, Riyadh has already started to ease down political tensions with Qatar, an important US Gulf ally which exerts considerable influence on Hamas, in the hope Doha will persuade the Gaza-based Palestinian faction not to obstruct any commitment Abbas might make towards exploring the potential peace deal. The Palestinian Authority source said Riyadh is not asking Abbas to sign the deal without negotiations but to consider the offer carefully, adding that Abbas appears willing to accommodate King Salman on the matter. Riyadh, says diplomats, is also likely to reach out to Ankara where Turkish President Recep Tayyip Erdogan is keen not to be sidelined over Palestinian-Israeli peace talks. According to regional diplomatic sources, it is King Salman who will reach out to Erdogan, though the Turkish president and Bin Salman might meet in Argentina on the sidelines of the G20, at the request of King Salman and with encouragement from Washington. Riyadh is also planning to offer support to regional and international efforts aimed at ending the conflicts in Syria and Libya. Diplomatic sources expect Riyadh to be a central player in supporting stabilisation in the two countries and that in the coming weeks and months it will become engaged in a way that it has avoided till now. There is also an economic aspect to Saudi Arabia’s regional plans. Expanding gas and oil cooperation with other regional players, and in cooperation with the UAE, is an essential part of Riyadh’s strategy. Saudi Arabia, of course, is in a position to offer massive investments, and according to one government official in Egypt, Cairo is keen to partner with Riyadh. “There are plans for huge Saudi investments in South Sinai which will be made public in the first half of 2019,” the official said. Meanwhile, an Arab diplomat based in a leading North African capital spoke of “big Saudi investments in Tunisia and Algeria” during the coming year. Some of these plans will be announced shortly after Bin Salman’s tour and some later in the year, the same source said.